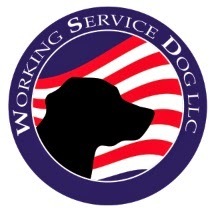 Working Service Dog Blog: Can You Tell the Difference Between Emotional Support Dogs and Service Dogs? Can You Tell the Difference Between Emotional Support Dogs and Service Dogs? Service dogs and emotional support dogs can come in any size and any breed. As indicated in the pictures, their vests can even be the same color. 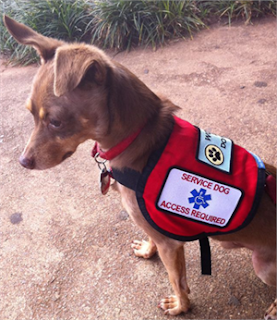 Therefore, it is vitally important to know how to tell the difference between emotional support dogs and service dogs. 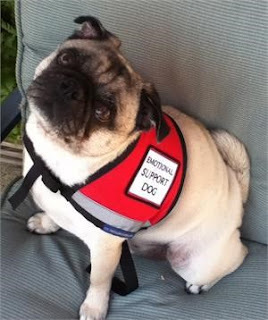 You must carefully read the words on the dog’s vest; that is the best way to know whether the dog is a service animal or an emotional support animal. Can’t You Ask Someone To Prove Their Animal is a Service Dog? No. Under no circumstance are you allowed to ask someone to prove their animal is a service dog. That is considered discrimination under the Americans with Disabilities Act (ADA). You are also not allowed to ask for documentation for the dog, nor can you ask the handler have the dog perform its task. Remember, it is against the law to misrepresent a service animal as such if it is not one. Because of this rule, you must assume that a dog wearing a vest labelled “Service Dog” is a legitimate service dog, and is providing vital assistance for the handler. You could find yourself in an uncomfortable situation if you are trying to figure out if the dog is an emotional support animal or a service animal. You must make sure the vest clearly states what kind of dog they have. Emotional support dogs and service dogs are not the same. They do not provide the same kind of assistance to their handlers, and many people do not know the difference between the two. We hope you now understand how it can be easy to tell if you are looking at an emotional support dog or service dog. All you have to do is look.